Common Ways Motorcyclists Are Struck by Cars in Florida | DeLoach, Hofstra & Cavonis, P.A. Motorcycle riders have to go through rigorous training and licensing requirements in order to ride on Florida roads. Unfortunately, they still have to share these roads with drivers who may not be doing their due diligence to avoid an accident. Year after year, motorcyclists are killed by drivers in completely preventable accidents—and most of these accidents happen under the same set of circumstances. Drivers have a duty to drive in a reasonably safe manner. This means they must be cautious of pedestrians, bicyclists, and motorcycle riders, as these victims often suffer severe head trauma or even fatal injuries, when hit by a motor vehicle. In addition to wearing high-visibility clothing and a well-fitting helmet, bikers should be aware of driving situations that are most likely to lead to a crash. Head-on collisions. A significant portion of car-motorcycle accidents occur when a car strikes a motorcycle from the front. 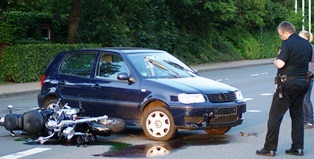 In a head-on collision, the motorcycle often flips forward onto the hood of the car, launching the rider onto the roof of the car before sending him onto the pavement. These accidents are overwhelmingly fatal to the rider. Left-turn accidents. When a driver turns left at an intersection, he may only be checking to see whether his path is free of cars. The tendency to look only for large vehicles causes drivers miss motorcycles in plain view, and often causes a driver to turn directly into an oncoming rider’s path. The biker may crash into the car as it turns in front of him, or be struck on the side or the front wheel as the driver swings to the left. Rear-ending. Commonly called fender-benders when they happen between two cars, however, these seemingly-minor crashes can be fatal to motorcyclists. Motorcycles have a much slimmer profile than cars, and drivers may not be able to judge distance adequately when riding behind a biker. If the rider has to brake suddenly, a car following too closely, may strike the back wheel of the bike and force the rider into the air. Side-impact crashes. Also called “T-bone” accidents, these crashes occur when a car strikes a motorcycle on one of its sides. This may happen when a driver runs a red light or creeps into an intersection without the right of way, and can result in the fracture or amputation of the biker’s leg. Sideswiping. These crashes can happen while merging, at intersections, or anytime a driver and biker are riding side-by-side. A driver may merge in front of a biker or veer into the biker’s lane, causing the car to slide or bounce along the side of the bike and spin out of control. In most cases, these crashes are a result of the driver failing to see the biker in his mirrors. Motorcyclists injured by cars should always seek the advice of an experienced injury attorney as soon as possible after a crash. The injury cost to victims and their families may quickly rise to thousands of dollars, and an attorney can determine whether they can help them collect compensation for their losses. In addition, an attorney can work quickly on your behalf to gather evidence of the driver’s negligence. The duty to avoid a motorcycle accident should be placed on all road users, not just motorcyclists. Despite numerous road-sharing campaigns, drivers are still overwhelmingly at fault for causing accidents and serious injuries to motorcyclists. If you're suffering after a motorcycle crash, our legal team can take over your case, to get the maximum compensation, while you take the time you need to heal. Simply fill out the form on this page today to make an appointment in our offices.